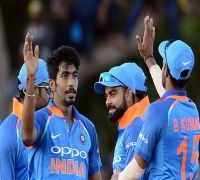 Jasprit Bumrah bowled eight brilliant overs to restrict Australia but he gave away 25 runs in the last two overs to spoil his economy rate and figures. Jasprit Bumrah had figures of 8-0-14-0 before the death overs. Bumrah has taken five wickets in the entire series. India has lost only once in the Feroz Shah Kotla to Australia. Jasprit Bumrah is currently the No.1 ODI bowler in the ICC rankings. His ability to bowl perfect yorkers at the death and maintain his accurate line, length on a consistent basis has made him a class apart from the rest of the bowlers. By his own lofty standards which he has set ever since he burst on to the scene in the Sydney ODI against Australia, this current series has not actually lived up to his stature. 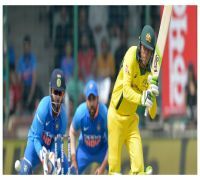 After a brilliant performance in the Vizag T20I, Bumrah was attacked in the Bangalore match as Australia won the series 2-0 for the first time. In the ODIs, he had a moderate game in Hyderabad before sealing the deal in Nagpur with a brilliant spell of 2/29. In the game in Ranchi, he went wicketless and had an economy rate of 5.3 and in Mohali, he was undone by the dew factor as he was carted for 63 runs despite taking three wickets. In Delhi, his see-saw momentum continued. Australia had made a decent start after winning a crucial toss. Usman Khawaja and Aaron Finch gave Australia a fast start. Bumrah came onto bowl in the seventh over and he immediately restricted the flow of runs. His plan to bowl back of a length and on a good length around the off stump area worked wonders. In his first four overs, he conceded just eight runs. In his next spell, he bowled full and bowled around the short of a length area. Bumrah mixed his length well and continued to choke the flow of runs needed for Australia to sustain momentum. When he came onto bowl in the final 10 overs, generally considered the death overs, Bumrah was in his elements. The right-arm pacer beat the outside edge of Stoinis as he used the angle and seam well to generate movement of the deck. After eight overs, Bumrah had remarkable figures of 8-0-14-0. With only three overs remaining and with Australia having lost momentum scoring just 51 runs in 13 overs and losing five wickets, the stage was set for a Bumrah special. However, it backfired. After conceding a couple first ball, Jhye Richardson used the pace to guide a full ball to the third man fence. Bumrah pitched it up outside off and Richardson drove brilliantly to the deep extra cover fence. When he responded with a yorker, Bumrah showed off his angry side and hurled a mindless throw back onto the stumps. However, it ricocheted and defeated Rishabh Pant’s attempt to stop the ball and he conceded another four runs. When Pat Cummins steered a full ball to the third man fence, 19 runs had come off the 48th over. Bumrah conceded four boundaries in the over. He had not conceded a single four in eight overs. Australia had tipped the match in their favour slightly. Another boundary in the final over by Richardson saw Bumrah conceding 25 runs in two overs as Australia ended on 272/9. The figures of 10-0-39-0 are not bad considering how the rest of the bowling fared on the Kotla deck. However, the bowling spell of Bumrah summed up the roller-coaster time he has endured in this series.